On a quick side note, we'd like to thank the pranksters at Beau Rivage for putting two 9s in front of John Dolan in the Million Dollar Heater victory pose we ran on our March cover. 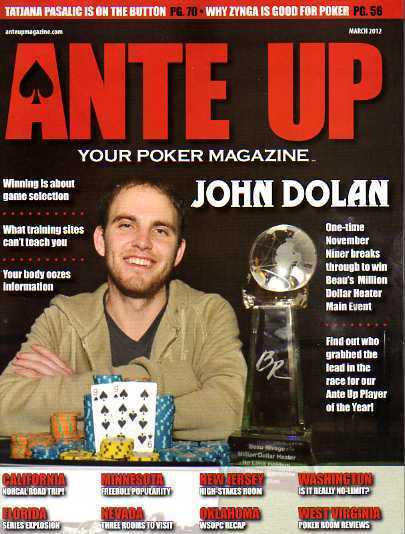 We were seeking a quick way to find out how many people actually look at our cover, and judging by our full inboxes and bloated voicemail from readers wondering how Mr. Dolan won an event with two of the same card, we happily have our answer. To say that I am not normally a social creature would be the understatement of the year. But this week saw a confluence of events and out-of-town visitors that brought out my inner mingler. 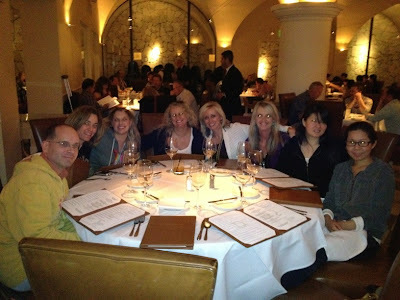 Most notably, my pals Grange95, WriterJen, and PokerLawyer all came to Vegas to celebrate my birthday a few days early. (Well, they all had other flimsy cover stories, but I know the real reason. It's all about me, obviously.) We were joined, at various times, by a bunch of others, including some I always enjoy hanging out with--LasVegasPokers, PinkLadiesPT, PokerVixen, CKBWOP, CureMTM--the last of whom tied us into a new circle of friends, as seen in the first picture below. 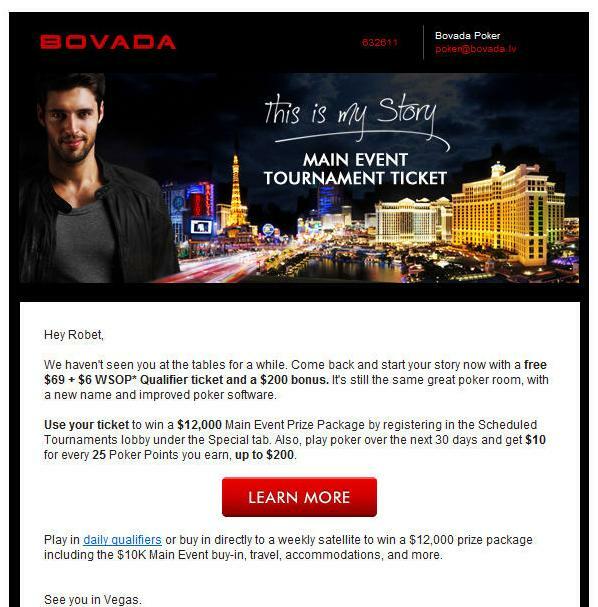 I had expected this to be a rather expensive week of socializing, but for nearly all of the things that cost much, one person or another was generously stepping up and insisting on paying either with casino comps or their own money. I have such nice friends! All in all, it was one of the best weeks I've ever had since living in Vegas, and almost certainly the best one that didn't include Cardgrrl. In fact, one downside to spending so much time with other people is that, paradoxically, it reminds me more acutely of how much I miss her. Almost all of the visitors have now flown back home, so it's back to the grind for me--which this weekend must sadly include a big chunk of time doing my federal income taxes. Ick. Your numeracy score is better than about 75-100% of all college educated individuals. Roughly, this means that out of every 100 people who take the test, you will do better than about 90% (90 people) of all other people. This is the highest score one can receive on this test. Technically, relative to the general population, you are among the most statistically literate in the world. Based on your score, you are not very likely to experience the extreme difficulty most people have when faced with common types of statistical thinking. However, you should still take care and may want to double check your calculations or seek additional advice when it comes to important decisions involving risk and statistics (e.g., some medical decisions, financial investment, taking consumer debt). In our uncertain and complex world you are likely to find that your higher levels of risk and statistical literacy are very beneficial and important. Indeed, your levels of numeracy reflect a skill level that very few people ever achieve… one that is the result of considerable practice. As the saying goes: " Practice makes perfect." Two odd poker-related visuals have caught my eye this week. It's the geography. Paris is indeed just across the street from the Bellagio, but that establishes that we're looking south on Las Vegas Boulevard from Flamingo Road. But then we see Caesars Palace further south, and facing us. This is wrong, because CP would be behind us, and facing east, the same orientation as Bellagio. But did he really win the final hand of the tournament holding a nine of spades and ANOTHER NINE OF SPADES? Let's all say it together: "Fouled deck. Take your bets back."